It's official: AMD's next-generation CPU is called Ryzen. Formally known as Zen, AMD's exciting new processors are set to launch in Q1 2017, complete with some features and capabilities freshly announced at the company's Tech Summit 2016 last week in California. We were in attendance. Let's discuss the big details first. AMD's desktop Ryzen platform also known as 'Summit Ridge', will include a CPU with 8 cores and 16 threads with a base clock of at least 3.4 GHz. 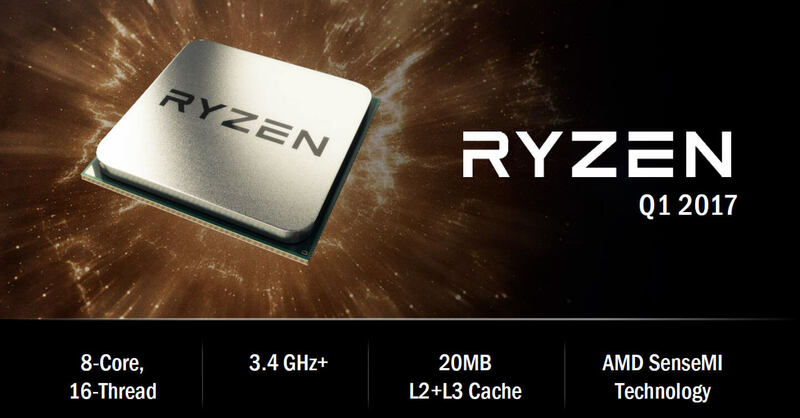 This was the first time AMD revealed the clock speed Ryzen will achieve, and the company stated that while engineering samples are currently running at the 3.4 GHz frequency, production units will be clocked higher than that. Summit Ridge will also include frequency boost technology, with exact boost frequencies still to be determined. Summit Ridge is set to include 16 MB of L3 cache and 4 MB of L2 cache at the high end. Supporting the new Summit Ridge CPUs will be the AM4 platform, of course, with DDR4 memory, PCIe gen 3, USB 3.1 gen 2, and NVMe storage. During the summit AMD showed us a Summit Ridge engineering sample running at 3.4 GHz (without boost) in a head-to-head battle with a stock Intel Core i7-6900K. The i7-6900K is a $1,100 Broadwell-E enthusiast CPU from Intel with 8 cores and 16 threads, clocked from 3.2 to 3.7 GHz, so it's a great processor to compare to AMD's similar Summit Ridge hardware. AMD showed Summit Ridge narrowly outperforming the i7-6900K in a Handbrake video rendering task, completing the render a second or so faster. We weren't told the exact Handbrake configuration used, but Summit Ridge matching the performance of Broadwell-E is very promising, especially considering AMD is set to introduce frequency boost and a higher base clock speed closer to release. It's also looking good for high-end Summit Ridge in terms of power consumption. In the Blender CPU rendering test that AMD first used to demo Ryzen a few months ago, Summit Ridge consumed around 3-5 watts less total system power than the Core i7-6900K. AMD didn't reveal exactly what was in each system, so the difference in system power could be explained by other components, however the company did suggest it was an apples-to-apples comparison. Summit Ridge was also shown consuming less total system power at idle, sitting at around 93 watts compared to 107 watts for the Intel system. At peak both systems jumped to around 190 watts, for interest's sake. AMD CEO Lisa Su reiterated that the company is on track to deliver a 40% improvement in IPC over their last-gen products at the same level of power consumption. "No games, no gimmicks, it's all about delivering the real product." And if the demos are a true reflection of Ryzen and Summit Ridge, AMD will be delivering a modern CPU that can truly compete with Intel's best. AMD also touched on a number of Ryzen's features, particularly surrounding a group of technologies they're calling SenseMI. The name "SenseMI" is essentially a brand for AMD's network of sensors and monitoring hardware built in to Ryzen, which itself isn't anything we haven't seen before in competing products (and last-gen AMD hardware). SenseMI technology is used in five key areas of Ryzen that will help deliver optimal performance and power efficiency. Pure Power: a closed-loop control system that optimizes clock speeds and frequencies to deliver the best performance at the least power consumption. AMD states that Pure Power is used to enable "lower power for same performance"
Precision Boost: works in tandem with Pure Power, but instead offers higher performance at the same power consumption level through clock speed boosts in 25 MHz increments. Extended Frequency Range (XFR): Perhaps the most interesting SenseMI feature, XFR allows the CPU to increase its clock speed beyond rated boost clock frequencies depending on the temperature levels. This sounds similar to Nvidia's GPU Boost 3.0 technology, which often boosts Pascal GPUs well above their rated frequencies. AMD says XFR will reward enthusiast coolers by allowing Ryzen clock speeds to scale with cooling solutions. Neural Net Prediction: The use of the term "neural net" is a bit loose here, however this technology will pre-load instructions by anticipating the actions a user will perform ahead of time. Smart Prefetch: This technology learns data access patterns to prefetch necessary data into the CPU cache so it can be immediately accessed where necessary. AMD will have more to share about Ryzen Summit Ridge closer to its Q1 2017 launch. Ryzen CPUs for servers, codenamed 'Naples', are scheduled for launch in Q2 2017, while the second half of 2017 will see Ryzen-based 'Raven Ridge' APUs for low-power devices.